Two speakers from diverse firms, both which analyze and promote financial market reform, speculated on the impact that the 2016 fall election results will have on the Dodd Frank Act. The panel discussion was moderated by Securities Law Director and CUA Law Professor David Lipton. 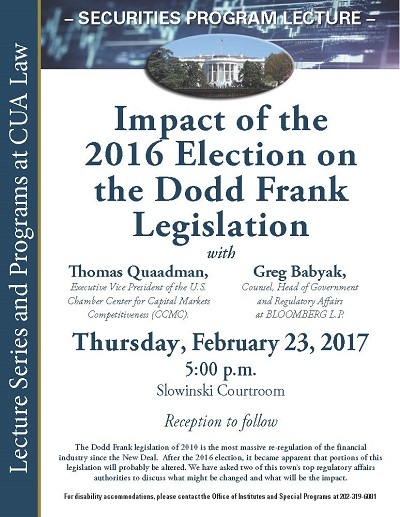 Quaadman, Thomas and Babyal, Greg, "Impact of the 2016 Election on the Dodd Frank Legislation" (2017). Securities Law Program Lecture Series. 3.